WASHINGTON (AP) - President Donald Trump's administration remains under scrutiny over potential ties between his associates and Russia in the run-up to the presidential election. Trump has denied knowing that any of his staff had communications with Russian officials during the campaign. But congressional probes are underway, and the FBI is investigating. 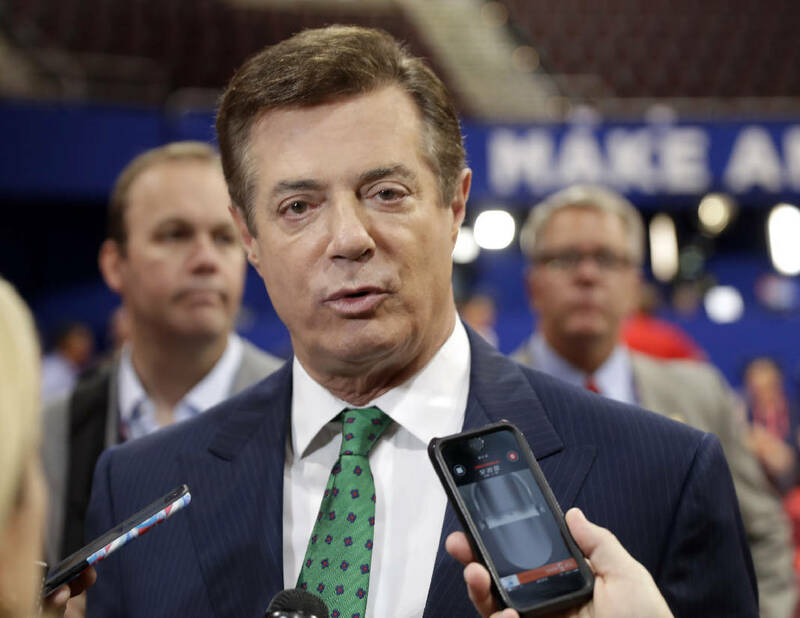 A longtime Republican operative and lobbyist, Manafort was hired by Trump in March to try to head off attempts by some GOP delegates to prevent Trump from becoming the party's nominee. He was later elevated to campaign chairman. Manafort resigned in August following revelations about his firm's longtime work on behalf of the former pro-Russian ruling political party in Ukraine before it was ousted over alleged corruption. Manafort and a deputy, Rick Gates, had orchestrated a secret lobbying campaign in Washington to obtain positive press coverage of Ukrainian officials and turn people away from supporting Yulia Tymoshenko, an imprisoned rival of then-Ukrainian President Viktor Yanukovych. Flynn resigned roughly three weeks into Trump's administration after it emerged that he'd misled White House officials - most notably Vice President Mike Pence - about his contacts with Sergey Kislyak, Russia's ambassador to the U.S.
Flynn had been interviewed by the FBI about his telephone conversations with the Russian ambassador, one indication that law enforcement officials were looking into his ties to Russia. Those contacts included a call with Kislyak on the day President Barack Obama's administration announced sanctions on Russia for meddling in the U.S. campaign. The Obama administration was taken aback when Russia, after first vowing retaliation, did not reciprocate following the sanctions. Flynn had told Pence and others that he hadn't discussed the sanctions with Kislyak on the call. He later conceded the issue may have come up, after the Justice Department warned the White House that Flynn could be in a compromised position because his public comments conflicted with what intelligence officials knew, based on recordings of the conversations. The U.S. routinely monitors foreign officials' communications in the U.S.
Trump learned about the contradiction six days into his presidency but waited three weeks to get rid of Flynn. The White House suggested Trump asked for Flynn's resignation because he could no longer be trusted. In recent days, Flynn has attracted fresh scrutiny after registering as a foreign agent for lobbying work he did for a Turkish businessman before Trump's inauguration. Flynn acknowledged that his work could have aided Turkey's government. Sessions defended himself by saying he'd met with the Russian envoy - once in his Senate office, once on the sidelines of an event at the GOP convention - in his capacity as a senator on the Senate Armed Services Committee, not as part of the campaign. He acknowledged later that he could have been more careful in his answer. Before serving briefly as a foreign policy adviser to Trump's campaign, Page was an obscure investment banker. Page worked out of Merrill Lynch's Moscow office for three years and advised on transactions for Gazprom and RAO UES, two Russian entities, according to the website for his current energy investment firm. He attracted attention for a speech he gave in July at the graduation ceremony for Moscow's New Economic School. In his remarks, Page was sharply critical of the U.S. and called Washington "hypocritical" for focusing on issues like corruption and democratization in its relations with Russia. He was never on Trump's campaign payroll, and Trump's team has long sought to distance itself from Page. But Page wrote recently that he was a frequent visitor to Trump Tower, which housed Trump's campaign offices. Congressional committees probing Russia's hacking during the campaign and potential Trump campaign ties have asked Page to preserve materials related to their investigations. Stone raised eyebrows last year when he claimed on Twitter to have knowledge about information WikiLeaks planned to release about stolen emails related to Hillary Clinton and the Democratic National Committee. "Wednesday @HillaryClinton is done," he wrote in October, appending the hashtag "#WikiLeaks." This month Stone acknowledged he communicated through Twitter with "Guccifer 2.0," the online persona that posted the DNC emails. U.S. officials believe Guccifer 2.0 is linked to Russia. Stone says he corresponded through direct message only briefly and that it was "completely innocuous." Stone has also denied communicating with Russia's government or with Russian intelligence.